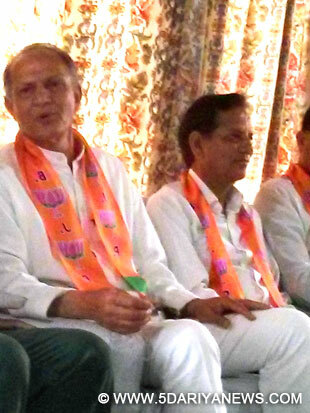 EX minister and the senior congress leader of Himachal Major Vijay singh mankotia’s brother Ajay Singh Joined BJP on Satureday,when Ex Minister and BJP leader of Dharamshala Kishan Kapoor inducted him in the party at presence of media at Dharamshala. When asked as if this move will not dent Major Mankotia, Ajay said, “I am a separate person and he (major) is the separate one we are free to choose any ideology. I was the great admirer of BJP and when asked could not restrict myself to join the party.”Major Vijay Singh was in news when he released a CD against Vir Bhadra about 6 years back and then left the party to join BSP. In the state assembly elections 2012 Major again joined back congress on the request of Vir Bhadra singh and fought elections from Shahpur and was defeated, Major, who is chairman of Ex Serviceman league still has a say among a mojor vote bank in Himachal.The move of Ajay singh to join BJP can dent Congress in the coming lok sabha elections of 7 th May, political experts say.